Father, why did the men treat Jesus worse than the other two guys on the crosses? I mean, the nails in particular. Jesus must’ve been so scared…. Belovéd Children, do not be negligent in your prayers to Me. I am the Lord God above and below, and your prayers are oblations to My Heart. Lend Me your ears, faithful Children. Listen as I tell you, pray My Belovéds. It mitigates all that you fear. I am a God of Love. I am not an angry God. 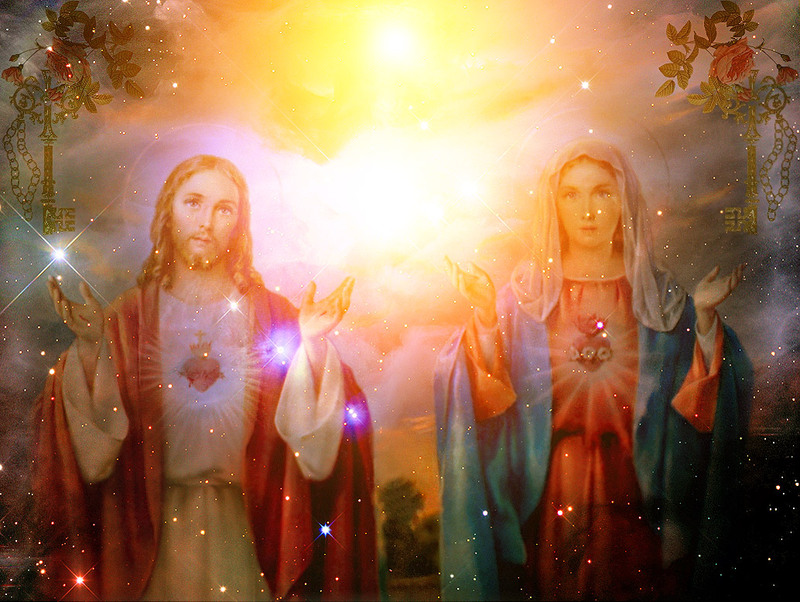 I desire My Belovéd Children to come into My Arms of Glory, to seek compassion and My Love and forgiveness. I am here for you, like a Loving and tender Parent. I wait for My Children to come to Me, and yet so few do or will. Belovéd Children, the stanchions are strong but the foundations must be stronger still. You cannot build your home upon sand, for it sinks with time. You cannot build your home upon mud. In time, it too will sink. You build your dwelling place upon rock, upon stone. Thus, when the mighty storm comes, your home shall be safe and strong against the winds and safe from destruction of the pelting rains. Belovéd Children, build your faith like a home with a solid foundation. You are tested or will be tested daily. Do you believe your own will can sustain you? Look to Me, Belovéd Children. Call out to Me, and I Love and forgive you and bid you to come into the Presence of the Lord God. I want My Belovéd Children with Me. I long for your Hearts and look so forward to bringing you into the beauty and paradisiacal or paradise of Heaven. I rule the Kingdom of Heaven and it is a Holy wonder. You know not the calibre of rewards that lay in wait for you. If you had but a minute idea, you would prostrate yourselves before Me eagerly, with great faith and adoring Love. You would prostrate yourselves before the Son of God and Man in thanksgiving for the Redemption He has given you. If you knew but a little. If you were given just a glimpse. But I do not force Myself upon you, but long for you to choose Me from your own wills and Hearts. I yearn for My Great Love to be reciprocated by My Belovéd Children. Oh Belovéds, look to the East as the morning calls. See the red sun burning the lands. See the red dragon torturing Man. You do not escape his destruction but can mitigate all calamities by your prayers to Me. You do not guess at the power of your prayers. Belovéd Children, My impatient ones, I Love you. Hold tight to this with great trust and faith. I guide you gently and whisper My Words of Love into your Hearts. Listen as I guide you. Trust in the Will of your Loving and Holy Parent. I answer your prayers even when you do not recognize this or them. Belovéd Children, My Patient Ones, how you delight Me with your constancy and Love. I look upon you with Great Love and give you My Peace and Blessing. Belovéd Children, in time you will marvel at what you do not see. Pray for discernment and I open your eyes. Pray for guidance and I let you hear. Pray for understanding and I place sweetness upon your tongues. Belovéd Children there is a greater sweetness still. One that you must, My Children must abide Me for this. Partake in the Eucharist. Revere it. It is the Most Holy and its gifts are unfathomable. The Son of God strengthens you by His Great Love for you. He has given His Life that you may live. Thus, I say, abide by Me in this. Strengthen your Souls and partake of the Eucharist. You cannot know the glories and Mercies bestowed upon you. The angels leap with gladness and prostrate themselves devoutly to the Son of God, the Lord Jesus Christ. How much more, as humans, My Children in My Own likeness, should you worship and Love the Christ? Belovéd Children, do not be frivolous with your time. The hour comes and you shall witness My Glory. The whole of Humanity shall be struck dumb and be amazed by the Mighty Glory of the Lord God on High. Belovéd Children, Love. Love and be merciful to one another as you shall hope for My Mercy for you. When you are merciful and Loving to your Brothers and Sisters, My Heart Swells. When you forgive your enemies without condition and with a full and genuine Love for them, I am made wondrously happy. It is an easy thing to forgive those who you already have Loved. How much more is the weight of forgiving and Loving those who have angered you or slighted you or caused you some harm. Engage yourself in Mercy and forgiveness, My Children. Mercy is a gift and raises the Heart from darknesses and lifts it into the Light of Love and thankfulness. Thus, I say, be forgiving and Merciful. Do not pretend at forgiveness. Expect nothing in return and rejoice when your enemy becomes your dearest brother. I touch the Hearts of many and look to the Loving and Merciful for or to provide My Guidance and wisdom. Belovéd Children, behold the East and know the destruction of burning blazes will consume the land. Pray for the mothers with children in their wombs. Pray and the Loving Lord God, your Loving Father mitigates the disasters facing you. The rumblings occur even now. The North will know no fire, and it shall know no rain. What was once an ocean, a vast ocean, will become barren. The land shall die of thirst and the animals shall be cut down where they stand. You shall thirst and call out to Me and know the thirst I feel for your Love. Belovéd Children, pray. I am a jealous God and see the adulation of gold and false idols abundant before Me. Children, do not be wedded to your money or to your fame and popularity. Do not be wedded to your office and riches and health. Do not adore these things, for they do nothing but lay waste to your Souls. Believe that I give you these things and can take them from you again, just as I can give and take Life. You are blessed by My Loving Will. When I see My Children in need, I guide you to your Heavenly Father by so many different means. Thus, I say, Belovéd Children, do not place your faith in this World. It is a fleeting thing, but trust in your Eternal Lord God who Loves you like no other. Peace, My Children. Peace. 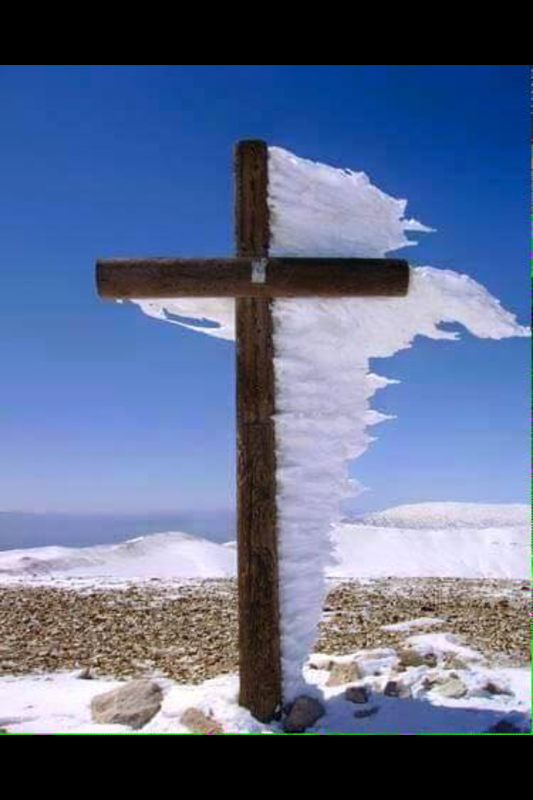 That's ice flying through the Cross!! Father, is praying in Tongues okay? And who is Elijah?? Turn to Jesus, My Belovéds and hold Him closely to your Hearts. His is the light and the path to Me. He is that comes before Me and I Love Him as I Love you. Belovéd Children, worship and Love Me with all of your Hearts. When a thing is against Me, the Spirit speaks within your Hearts. When it is something for Me, it is right and just. It is a winged prayer that I Love and you are not to deny Me, the Lord God, this gift of songs. Pray, Belovéd Children, for your discernment is minimal and you must understand my Will. My Will for you is good and correct, yet so many of My Belovéd Children deviate from My plans for them. It will bring them terror when they have fallen behind Me into the darkness of the pit where there is no reason, nor Love. Belovéd Children, you must pray to your Lord God. Pray when you wake and as you work and before your eyes are closed again to this World. Children, pray and I hear your calls. I listen and stay with you always. The Belovéd Christ calls out to you. He is My Belovéd Son who has sacrificed Himself for Love. For Love of you. Do not reject the Sacrifice and Love of the Lord Jesus Christ. Do you not know the nature of His Love for you? Pray and understand that His presence chases away sickness and the idle. He is the Light of this World and the Son of God and Man. I Love My Belovéd Son, the Christ. Worship Him according to My Love. Seek out the Lamb and know you shall be guided to Love. You cannot breathe life without My Love. The Spirit enters you and shines a holy Light upon your Hearts. Pat attention to His light for it shall glorify Me and lead you through darkest days. The Light of the Spirit is within you. Let it make its way through the whole of your lives and the path to My Kingdom is made straight. Belovéd Children, look to My Son in all things. His Will is My Will and I long to give My Children forgiveness and compassion. See the North and they seek no forgiveness for their iniquities against the Son of God. See the faces of the poor and wretched and they are not preserved, their lives, but they shall reap their rewards in Heaven. Do not reward yourselves in this World, for these are temporal gifts and do not fare you well in death. Of what use is a stone or chip of gold when you have died? I need no rocks and gold is like dust to Me. Thus, I say, forget your gold and forget the stones you build with in this life and look to Me for compassion and forgiveness. My Mercy is for you. I give it freely to those who come to Me in repentance and with Love and adoration and trust in their Hearts. Belovéd Children, you cannot run from what destruction comes, but I say, do not be afraid. I am your Heavenly Father and I will let no evil befall the Children who pray. I long for your prayers and want you to pray often to Me that I might hear the sweetness of your Words. Belovéd Children, look to the East and the skies are emblazoned with fire. The trees shall wilt and burn and the land shall grow black with soot. Do not close your eyes but watch the East before you and long for the Word of God. Long for Me as I do for you. Thus I say, the North will be uninhabitable and the East a black mound. All of My Children shall weep for Me and I will hear the prayerful. Belovéd Children, I say pray. Pray as I Love the prayers of My Children. Trust in My Will for you and lay waste to your doubts. My Love is a simple Love and I ask for your Love in return. My Love is as gentle as a dove in repose and I place this Love upon your Hearts minutely. Belovéd Children, know this to be true. I am the Lord God. I am with you always but I am an unobtrusive God and Father. I do not impose My Self upon My Children but allow you to impose yourselves upon Me with great joy! Thus, I say, come to Me for renewal and Love. Come to Me for Mercy and forgiveness. Come to Me with your Love and My Heart swells with your offering of Love. Belovéd Children, do not stray from Jesus, but follow ever in His footsteps. The path of the Christ is the path to Me, your Lord God and Father. This I say, Love My Son with all of your Hearts and worship Him fervently. Belovéd Children, your faith will be tested and you must be prayerful. Those who stray even a little will fail in their testimony to the Lord God and what is there to say after? Pray and be faithful to your Lord God and My Strength and Love shall guide you always. Pray, Belovéd Children. Pray. Belovéd Father, thank You for filling me with Your Love and joy. Bless our priests with Your guidance and Love. Belovéd Children, I am before you like the sun comes before the night. You are My Children and I adore each of you as I have made you. Come to Me, with your Loving oblations, and know the peace and consolation of My Forgiveness and Great Love for you. Mine is an Eternal Love, and so great that you cannot fathom or understand it. I am for you as you are for Me. Grasp this, My Children, that your sins are many and they are grave. How I Love My Sinning Children even while you must account to Me for every sin. My Joy is in your Love for Me, your Lord God and Father. I rejoice in the Souls of My Children and look with joyous Love as you each make your ways toward Me. Belovéd Children, follow the truth and the Life. Follow the truth and Love of My Belovéd Son, the Christ Jesus who is also with you as you live and die in this age of sin. Do not ever fear the Love of the Lord. I am a just and compassionate Lord. When you come to Me in sorrow and with a Loving and repentant Heart, I Lovingly and Joyfully take you up to My Breast and embrace you in Love and Forgiveness. Children, I am the Lord God and know that I am Love. You cannot know Love without Love. Thus I say, go out unto this World and Love your Brothers and Sisters. Speak to them with Love and not charity within your Hearts. [That is, not because you ‘have to’ but from sheer love of people.] Love your Brothers and Sisters always, fully, and unconditionally. Know in your Hearts that this request is a reasonable one for your Souls. Know this. My very Belovéd and Heavenly Son was hated by those who were to Love Him. Do not walk with those who have hated and who hate but pray for them and Love them patiently and with consistency. Belovéd Children, be merciful as you walk in this World. The Love and Mercy of your Lord God and Father shall echo your own. Thus, when you forgive a debt, so I forgive your own. When you forgive a transgression, I am pleased to forgive you the many transgressions of your own. When you are merciful in your behavior or actions, this is Love that speaks and you shall feel the Glory of God working or coursing through you. Oh, Belovéd Children, emulate the Mercy and Love the Christ has bestowed upon you, for His was a perfect Love in Humanity just as it is a perfect Love in Divinity. Cast aside your anger and griefs with your Sisters and Brothers. Offer Love when they will hate. Offer Love when you are accused. Offer Love when the World condemns you. Offer Love as others scorn you. My Son, My Belovéd Son is all-knowing and sees your Love and Mercy for others. Such joy does this bring His Divine and Beauteous Heart. Children, to Love is not a harsh [difficult] thing when you have emptied yourself that I might fill you with My Graces. Trust in your Lord God and Father and see how this World for you will change. Belovéd Children, I say to you, enjoy or take advantage of the many Blessings of the Eucharist. When you partake of this Most Holy of Holies, you receive an abundance of graces and blessings. Know that one day when you shall go forth to meet the enemy, you shall be greatly fortified by the Eucharist. And when you are faithful to the Christ and honor and adore Him for His Greatest Sacrifice, you shall bear witness to its strength and Holiness. You shall have access to the Divine Host when no one else will find it. The faithful shall be given a lighted path to attain the Graces of the Holy Eucharist while others shall starve to know it. Thus I say, gather yourselves to its Blessédness and partake of this Greatest Holy gift. It is redemption and Life. It is Christ resurrected, and He is My Most Belovéd Son. You are given great mercies by His BIG Love for you. Be devoted to the Christ. Love My Belovéd Son deeply and completely throughout your Hearts and you shall know the sweetness of Redemption and avoid the utter darknesses of condemnation. Belovéd Children, I say to you, pray. I shall always ask you to pray. I hear your prayers and answer them correctly by My Will for you. Though you may suffer now, what gifts await you after. I shall kiss your brows and welcome you into the Kingdom of Heaven. Do not weep in your struggles and difficulties. I am with you. I see your suffering and I look to you with Love in My Eyes and with joy in My Heart for your patient endurance of your agonies. Belovéd Children, it is better to suffer on earth than it is to swoon inside the pain of Purgatories. Purgatories differ and each of you is purified according to My Will. Do not be afraid, My Children, but know that any suffering endured by you in My Name, in the Name of the Christ Jesus, endears you to Me and I bring you closer to My Loving Light every day. Belovéd Children, this time or your time in this World is but a blink of Time in Eternity. Thus I say, live patiently in the knowledge that this pain, like the rewards in this World, is temporal. Belovéd Children, share My Love and gather My Souls to Me. I thirst for your Love, My Children. Peace, My Children. I give you My Wondrous Peace. Belovéd Child, search within yourself and know that I caress you with My Abundant Love. Yes, you are for Me Little Child as I am for you. Do not wait or be weakened by the constant pulls and miseries of this World, for I am perpetually amongst you, Loving you, cherishing you, guiding you to Me. Listen, oh Children of Mine, prayer is the most important element of your Souls. You cannot know Me or My Heart and Will if you do not delve into the Love of prayer. I speak softly to My Children and answer those whose prayers are constant. I am the Lord God and Father. I reign in Heaven as I shall reign in this World. All things of this World are temporal. Do not be deceived by the one who is seeking (your souls) or who would like you besotted by him. My Belovéd Children, you are Mine and I seek out each of you to be in My Holy and Eternal company. Come to Me, oh Children of Light. Be guardians to those Children who do not know Me. Pray that others will turn to Me and away from sin. Your prayers give you mitigations to all that comes. Your disaster is lessened. Your Time is widened. Your Hearts are opened to Me and I answer your calls, My Belovéd Children. Oh, Belovéd Children, there is such sinning against My Belovéd Son, the Christ who has sacrificed for your redemption. Such sins burn within His tender Heart and He weeps for your Souls. Do not sin against My Christ Jesus, for He is My Most Belovéd Son and I adore those who adore Him and I Love those who Love Him and I abhor those who abuse the Name of My Son and His Heart. Turn to Me in all of your challenges or difficulties. Do you not know that I am here for you as a Father dotes upon and protects His Child? I am for you and wait longingly for your calls. Belovéd Children, Love My Beauteous Son, the Christ Jesus. You must know (that) the Heart of Jesus is filled with both Love and dread for you. Oh, how He Loves each of you so thoroughly. His Love is exquisite and the sins of Man bring Him such pain, just as they bring Me such pain. Do you not understand or see that I am Love. I do not wish ill for My Belovéd Children. I rejoice in your Love and revel in the joy of attaining the Soul(s) of all of My Children. Belovéd Children, your Mother, the Blesséd Mother cries out for you to Love her Son, Jesus, for He is worthy of only Love and adoration. His Sacred Heart yearns for your Love and she seeks to show you the way to Loving Him. Oh splendor! Belovéd and Blesséd Mother, how she weeps for all of Mankind. How she weeps over the betrayal of Man of her Belovéd Son. Children of God, hear her calls. Hear My Calls! I call you to action, My Children! I call you to Love your Brothers and Sisters. Fill yourselves with Love and turn your faces away from sin. Pray! Pray, for it is through prayer that all things are made possible. Strengthen your faith, My Belovéd Children. How its very foundations will be tested by this World. How you shall be tested! Thus, indulge yourself in the Love of the Christ and strengthen your Souls by contemplation of His Passion and by partaking of the Holiest of all Holies, that which is His Body and Blood made Divine. Belovéd Children, imbibe in this gift that is given to you and rest warmly or assuredly with your Hearts in My Heavenly Hands. Glorify the Son of Man and turn away from sins. Come to Me in repentance, and I will have Mercy on every Child with sorrow in His Heart and Love in his Soul. Come to Me for guidance and for repose. I am a Merciful, compassionate Loving God. I do not want to see My Children suffer by wallowing in sinfulness. Belovéd Children, you are renewed by My unending Love and ever-willing forgiveness. See the Hand of God that extends down to you that you may be lifted by Love and Mercy. Take My Hand, My Belovéds. Be one with Christ. He is what saves Man from an eternity of misery, of “no” or an eternal emptiness and you shall rejoice in this knowledge and that you have trusted rightly the Son of God. You come to Me through His Love for you. Do not abandon His Love, but share His Love generously with others and be unafraid to declare My Glory and Love for this World. Come to Me, Children, and know the comfort and relief of forgiveness and Mercy, for Mercy is a gift. Let your Hearts rest upon this firm knowledge or absolute trust and faith. I am your Lord God and Father and desire only good things for My Belovéd Children. Trust in Me, My Belovéds, and give Me your Hearts. Pray, My Children and I shall answer your calls. Know I am ever with you, Loving and blessing you with gifts of Love. Belovéd Children, do not be frivolous with your Time. Turn away from sin. Do not think to wait for tomorrow, for your Time may come abruptly and what shall you say when there is no prayer of praise on your tongues? Be devoted to Me always, My Children. Follow the path of the Lord Jesus Christ. His Love will sooth your Souls if you will but let Him in. Belovéd Children, pray and know My Peace is with you always. Do not fear, for when you are for Me, I am for you. You are led astray in this World by the temptations of sin. Thus, I say to you, fortify yourselves through prayer and Love. Belovéd Children, fortify yourselves.